Welcome to our homepage. Please click the links above to navigate the site or browse our news stories below. The Mepham English Department is proud to announce that Ms. Linu Chacko and Mr. William Morris have achieved National Board Certification, the most advanced professional credential available to teachers in the United States. Ms. Chacko’s and Mr. Morris’s candidacy, which took approximately 24 months to complete, involved a number of assessments on teachers’ content knowledge, differentiation in instruction, teaching practice and learning environment, and effective and reflective practice. Sixty percent of their total score came from the creation of an extensive teaching portfolio that must include descriptive aspects of lessons or assignments, new and original analyses and reflections on teaching practice, samples of student work, and classroom videos. For over 30 years, The National Board for Professional Teaching Standards (NBPTS) has awarded National Board Certification to those teachers who have demonstrated accomplished instructional practice and leadership in their schools and communities. The certification process takes most teachers 1-3 years to complete, and it is considered the “gold standard” in teacher certification. Since 1995, approximately 2,000 teachers in New York State have achieved National Board Certification, and it is estimated that only 3% of the teaching population nationwide is made up of National Board Certified Teachers (NBCTs). Ms. Chacko and Mr. Morris are among a small group of Bellmore-Merrick teachers who have earned this prestigious recognition. 23 students were slated to perform in the competition, many of whom returned for their second, third, or even fourth year as POL contestants. After each performer had his or her chance to recite a selected poem, judges' scores were tallied by Mr. Cooney, Mrs. Ackerman, and Ms. Chacko. Maya Aptekar's recitation of Propositions by Stephen Dunn placed third, Eimann Khan's interpretation of Caged Bird by Maya Angelou placed second, and Candace Casimir's performance of I Am Offering This Poem by Jimmy Santiago Baca took first place. In her introductory comments at this past week's event, Ms. Maresca highlighted the successes of past Mepham POL winners. She asked, "Will this be the year that Mepham sends a winner back to Washington, D.C.? " Casimir and Khan will represent Mepham High School in the Nassau County POL Regional to be held in early 2019. There they will be joined by winners from other area schools, including Calhoun and Kennedy High Schools. Six students from Mepham High School recieved honors and cash prizes from the 2018 Martin J. Kelly Writing Contest of the Irish Cultural Society, including two First Prize winners. This year, students were asked to write 250-300 words in the voice of a tour guide describing a site in Ireland that has significant historical, cultural or legendary importance. Gabi Davi, Matthew Grossman and Lina Fitzroy recieved Honorable Mentions for their entries, which includes a $35 cash award for each. Rachel Eisert was one of three Second Prize winners from Long Island who will recieve $150, and Ali Heller and Caroline Coyne are two of three First Prize Winners who will recieve $200 each. The English Department wishes to extend congratulations to all of the winners and thank Ms. Ackerman, Ms. Castellano and Ms. Sirof for promoting the contest with their classes. Students seeking writing contest opportunities should check the "Contests" link on this website for updated information. Frank Merklein (on camera) and the director of the "Howdy Doody Show" (1952). Photo courtesy of the Merklein family. Most Mepham High School families didn't have television sets in their homes when Frank Merklein, Sr. graduated in 1940. But that didn't stop Mr. Merklein from making his mark on the television industry! ​After graduating high school and serving in the Army Air Corps reserves during World War II, Merklein moved back to New York and attended the RCA Institute to earn a TV diploma. Soon thereafter, he began working for NBC. After a long and illustrious career in television, Frank Merklein retired in Florida. A story about his impact on the industry appeared in the Palm Beach Post in 2014. BMB learned much about Mr. Merklein from his close friend, Class of 1941 alumnus Jerry Worthing. 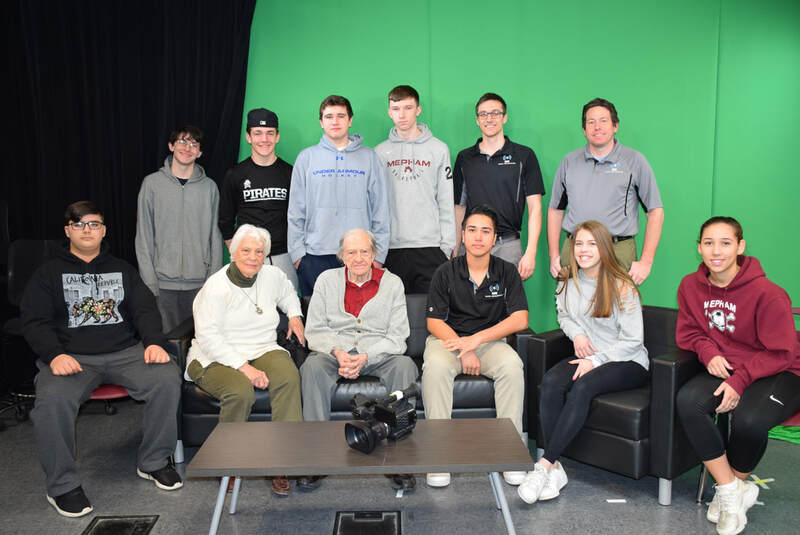 Mr. Worthing contacted English chairperson Mary Donnelly several weeks ago to inform her that Merklein, who had recently passed away, left a monetary gift in his will to be used to support the Bellmore-Merrick Broadcasting Program. Jerry Worthing and Frank Merklein were high school friends who stayed in touch throughout the years. Jerry Worthing and his wife Clare, also a Mepham graduate, visited the BMB Studio this morning to meet Mr. Stein, Mr. Russell and the BC II students. The visit began with a behind-the-scenes look at the filming of one of BMB's magazine news packages from BMB's control room. Then Mr. and Mrs. Worthing enjoyed some snacks with the students while waiting for the 3rd period BC II and III students to arrive to interview Jerry Worthing and learn more about his friend, Frank Merklein. 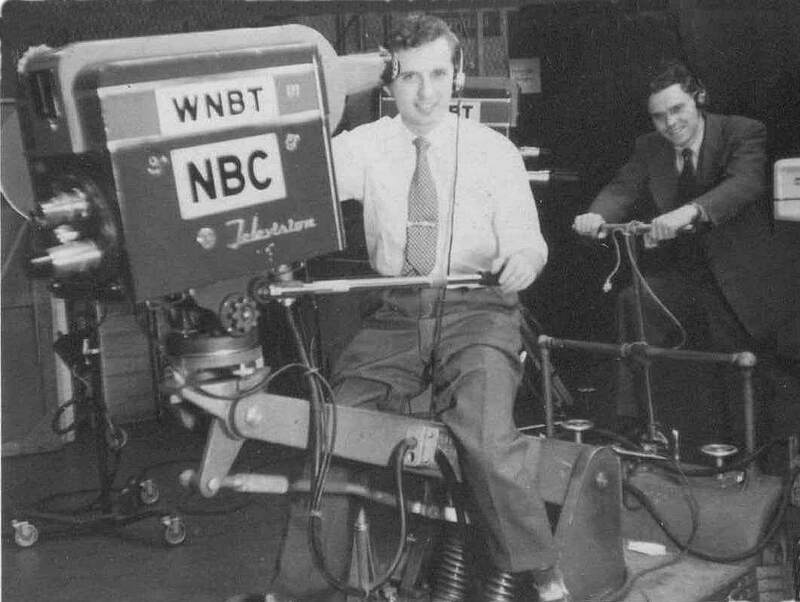 Jerry Worthing spoke proudly of his friend, one whom he said dedicated his career to spreading television's technological advances around the world. The monetary gift, which was sent to Mr. Gomez by the Merklein family, has been forwarded to the BMCHSD Board of Education for approval. It will eventually be used to purchase equipment for the Broadcasting program, which is in alignment with Frank Merklein's wishes. In the wake of the recent tragedy at Marjory Stoneman Douglas High School in Parkland, Florida, we’ve learned firsthand about the power of student-led activism as survivors effectively use their voices to inspire a nationwide call to action. While most high school students are not old enough to vote in November elections, all have a voice that deserves to be heard! This event will be hosted by English Department Chairperson Ms. Donnelly, an experienced op-ed journalist whose writing has been featured in local and national publications. Learn how to use the persuasive writing skills you’ve learned in English class to share your views about ANY political issue of personal importance, and then send your letter to elected officials via e-mail or snail mail or submit your work as a Letter to the Editor at Newsday, The New York Times or any other publication. Visit the ELITE website to register. NOTE: This event has been cancelled due to snow days. Stay tuned for a possible reschedule date. The Mepham sophomore stunner is now slated for Syracuse! Mepham sophomore Candace Casimir attended, and won, the Poetry Out Loud Regional Competition held at Nassau Community College in Garden City on Friday, February 9th. Candace, a student in Ms. Malone’s English 2 Honors class and a member of the Skull and Bones Drama Club, won the Mepham Poetry Out Loud competition in December with her recitation of Snow Day by Billy Collins. She and runner up Anna Mouras were invited to represent Mepham at the Regional Competition. Each participant at this level was tasked with preparing three poems for the competition, the first two for the preliminary rounds, and the last reserved for the championship round. All nineteen participants were from high schools in Queens or Nassau County, and they were among the top two scorers in their school competitions. Candace’s flawless recitations of Art vs. Trade by James Weldon Johnson and Snow Day put her on the list as one of the top 7 scoring readers to participate in the final round along with Anna and a senior named Nicole Formisano from John F. Kennedy High School. The competition was fierce, with all readers in the final round offering captivating recitations of their last selected poem. In the end, Candace wowed the crowd (and the judges) with her thoughtful interpretation of Friendship After Love by Ella Wheeler Wilcox. 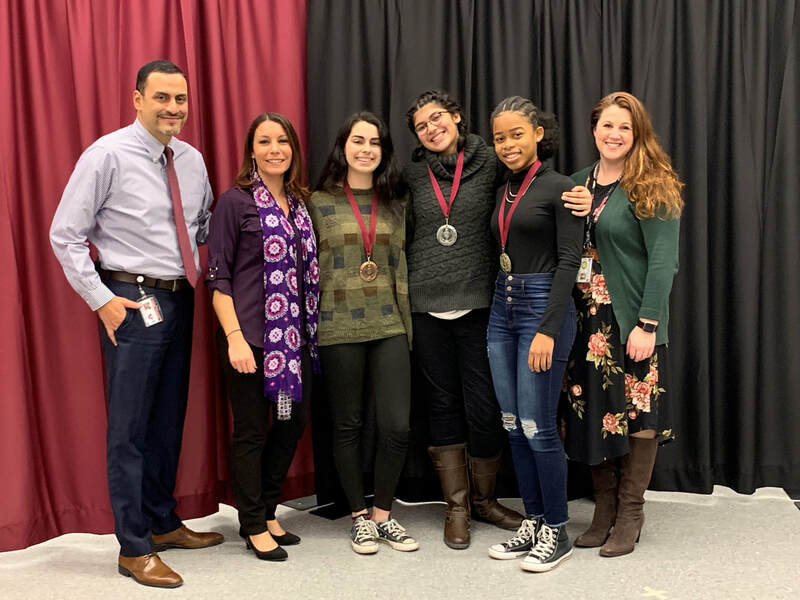 Candace and runner up Alisha Guitierrez from Valley Stream Central HS will attend the New York State Poetry Out Loud Competition in Syracuse on March 9th, where each student will vie for a chance to compete nationally. Performance poet Billy Lamont shares some of his work in his opening address to Calhoun, Grand Avenue, and Mepham Creative Writing students. Creative Writing students from Mepham, Calhoun and Grand Avenue enjoy a unique workshop experience. Students enrolled in Ms. Maresca's Creative Writing I class at Mepham High School traveled to Calhoun High School on Monday, December 18th to participate in a poetry writing workshop with Long Island poet Billy Lamont. Lamont, who has conducted similar workshops for students elsewhere in Nassau County, shared some of the poetry he has written through the years, discussed his creative process, and led students through various creative writing prompts. The workshop, which was funded by a BMCHSD Mini Grant awarded to the English Department, concluded with a performance poetry showcase where student participants had an opportunity to share some of their own creative work. A similar workshop will be hosted at Kennedy High School in January for students from Merrick Avenue Middle School and MAP. ​The winners of Mepham's 11th annual schoolwide Poetry Out Loud contest are 1st Place – Candace Casimir (10th grade), 2nd Place – Anna Mouras (12th grade), and 3rd Place – Kiley Coen ( 12th grade). Casimir, who took 3rd place in the 2016 competition, will be joined by Mouras as both students compete in the Nassau County Regional competition at Nassau Community College on February 9th for a chance to compete at the state level. Poetry Out Loud is a national arts education program that encourages the study of great poetry by offering educational materials and a dynamic recitation competition to high schools across the country. Since 2005, Poetry Out Loud has grown to reach more than 3 million students and 50,000 teachers from 10,000 school in every state, Washington, DC, the US Virgin Islands and Puerto Rico. Student competitors begin at the classroom level, and winners advance to a school-wide competition, then to a regional competition, and ultimately to the National Finals in Washington, DC. The winning students are pictured above with Ms. Nicole Maresca, who teaches English and Creative Writing and also moderates Fragments, Mepham’s literary magazine, and English Chairperson Ms. Mary Donnelly. On Monday, November 27th, Ms. Donnelly met with the Mepham High School PTSA to give a brief overview of what's new in the English Department. The presentation focused on AP offerings for English and the three new electives that will be offered for the 2018-2019 school year. Download the presentation slides below. ​The central purpose of any school summer reading program is usually a rooted in an attempt to combat the “summer slide” that often occurs when students take long breaks from academic instruction, but what happens when the book (or the list of books) from which to choose does not appeal to you? Do you wrestle your way through it? Do you abandon it? Do you (GASP!) skip the assignment altogether?